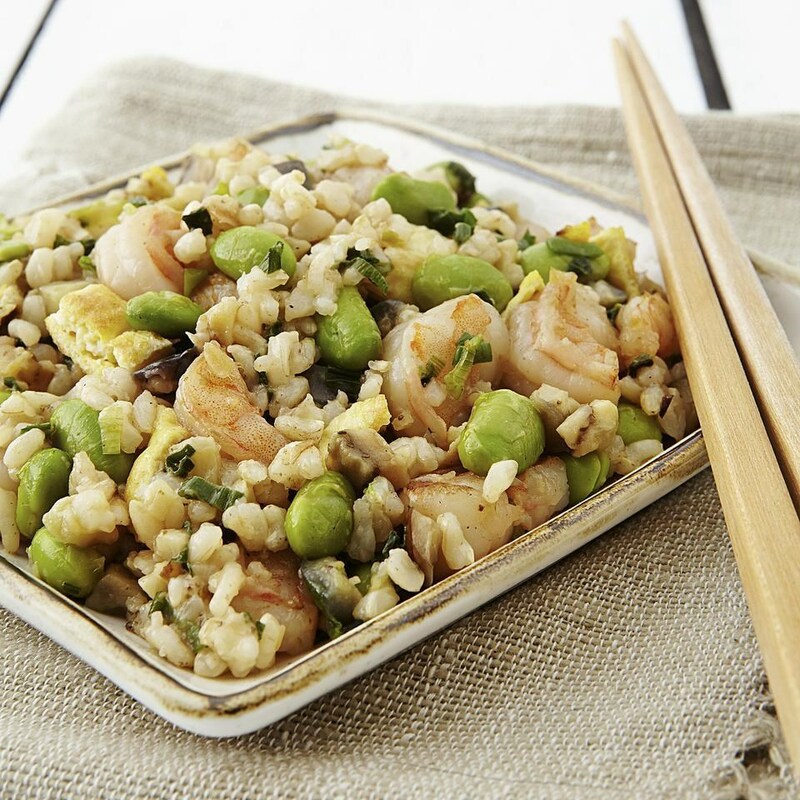 In this healthy fried rice recipe, shrimp, eggplant and edamame are tossed with tangy Japanese ponzu sauce for a delicious one-bowl dinner. 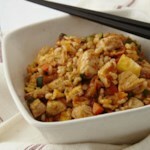 If you don't have leftover cooked rice on hand, be sure to thoroughly cool your rice before adding it to the wok—if it's too warm, it creates too much steam and sticks to the wok. To quickly cool warm rice, spread out on a large baking sheet and refrigerate while you prep the rest of your ingredients, about 15 minutes. Add 1 tablespoon oil to the wok along with scallions, ginger and garlic; cook, stirring, until scallions have softened, about 30 seconds. Add shrimp and cook, stirring, for 1 minute. 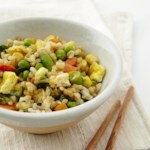 Add eggplant and edamame; cook, stirring, until just tender, 2 to 4 minutes. 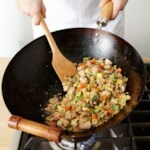 Transfer the contents of the wok to a large plate. 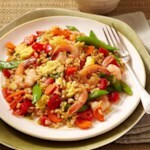 Return the shrimp, vegetables and eggs to the wok; add ponzu sauce and stir until well combined. For sustainable shrimp, look for shrimp that's certified by an agency like the Marine Stewardship Council. If you can't find it, choose wild-caught shrimp from North Americait's more likely to be sustainably caught. 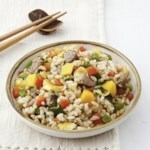 Look for prepared ponzu saucevinegar and lemon juice-flavored soy sauce commonly used in Japanese cookingnear other stir-fry sauces in well-stocked supermarkets. 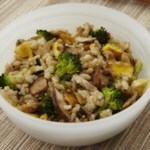 Try it to flavor stir-fries or use in marinades for grilled meats and vegetables.